Cedar Grove High Cadets Present Colors at Ceremony Featuring Lewis. A group of students from one DeKalb County School District (DCSD) high school recently got up close and personal with a civil rights icon. Cadets from Cedar Grove High School’s Navy Junior Reserve Officers Training Corps (NJROTC) presented colors at a Naturalization Ceremony hosted at the United States Citizenship and Immigration Services Atlanta Field Office on Jan. 12. The ceremony, which features new citizens taking the Oath of Allegiance to the United States, welcomed Georgia Congressman John Lewis as its keynote speaker. Among being known as a public servant, Lewis is renowned throughout the country for being a civil rights leader and activist. 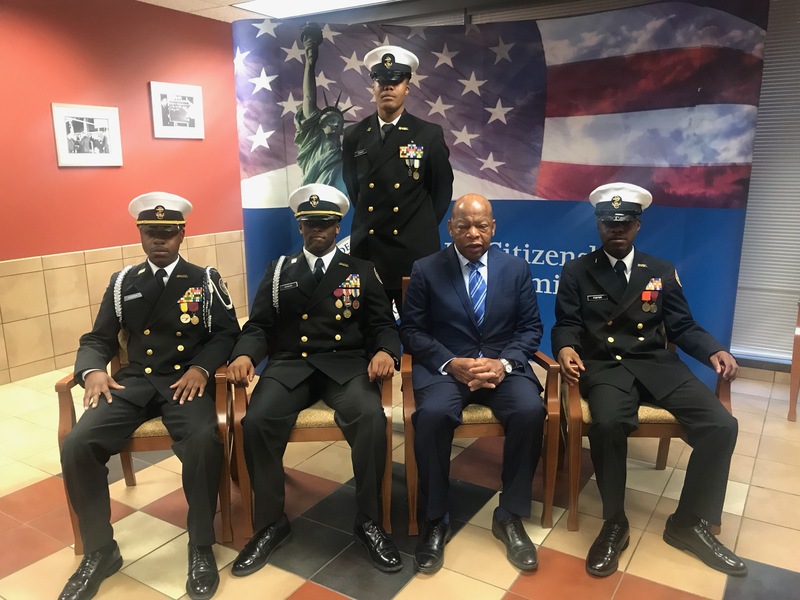 The four cadets from Cedar Grove High— Darion Foster, Nigel Howard, Trevion Foster and Norman Trawick—had the chance to meet Congressman Lewis face-to-face and speak with him one-on-one.